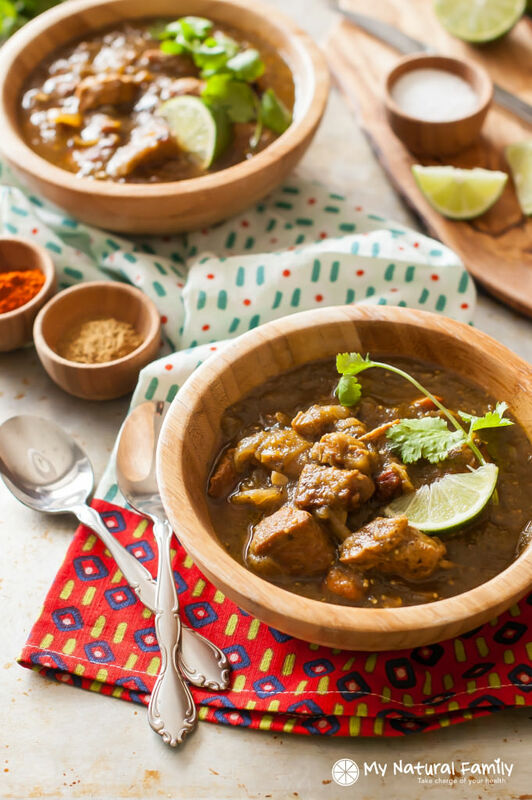 You will love the flavor of this pork chili verde crock pot recipe. I love to get it made the night before and then start it cooking in the morning. This is a flavorful dish and tastes so good all on its own, but you could eat it with something else, depending on your diet. I made this and brought it to my brother’s wedding luncheon. We had about 10 different kinds of soup. This was a huge hit. My brother even told his wife what a good cook I am, which I thought was cool because I’ve cooked for him plenty of times, but apparently this dish really impressed him. I can’t tell you what amazing depth of flavor this chili has. It can be spicy if you want, or not so spicy. But, personally, I am NOT afraid of spice. For example, my neighbors are Mexican and invite us over for parties often and freak out every time I pour the hottest salsa on my tacos. But I LOVE all things spicy. Even my children like a medium amount of spice, which is pretty unusual for children. One of the things I really like about this pork chili Verde crockpot soup is that you cut up a pork roast to make it. Basically, you make your own stew meat. Come to think of it – why can’t you buy pork stew meat, like you can beef stew meat? It’s not a common soup, so it’s awesome to eat when you’re sick and tired of the same thing. It is Paleo, but it’s one of those kinds of meals that’s easy to make Paleo and your guests or family will not even care it’s Paleo. You could make it on the stove top as well, just simmer everything in a covered pot on medium heat for 2 hours. You would need to add another 3 c. of chicken broth as well. 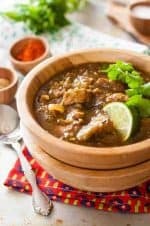 Please let me know if you try this pork chili Verde crock pot recipe. I would love to know if you love it as much as I do. Verde is a green sauce made with chili peppers, tomatillos, cilantro, onion, and garlic. What does tomatillo sauce taste like? Sometimes tomatillos are called jamberries or Mexican green tomatoes. They have a slightly herbal flavor and a tart fruity flavor. Most of the time they are used in making sauces and salsa. Raw tomatillos have a sharp tasting flavor and can be a little acidic. When they are cooking their flavor tends to mellow making them taste a lot sweeter. You can eat them raw and if you do I suggest putting them in salads, dips, and salsa. You can also grill or roast them whole. This was so good all on it’s own. You could make it on the stove top as well, just simmer everything in a covered pot on medium heat for 2 hours. You would need to add another 3 c. of chicken broth as well. Preheat oven to 450 degrees. Line a baking sheet with tin foil. Place the tomatillos(halve them if they are large) and the poblano or anaheim peppers on the lined baking sheet and place them on the top rack of the oven. Roast for 25-30 minutes, or until the tops are charred. While the tomatillos and peppers are roasting, heat the olive oil in a frying pan over high heat. Add the cubes of pork to the oil and brown on all sides. Place the pork in a slow cooker. Reduce the heat to medium/high and add the onion. Saute for 2 minutes, or until softened. Add the garlic, oregano, cumin, paprika, chili powder and salt and saute for another minute. Add the chicken broth, bring to a simmer and pour the mixture over the pork in the slow cooker. When the tomatillos and peppers have finished roasting, remove them from the oven. Remove the charred skin from the peppers and place them and the tomatillos in a blender along with the cilantro and green chilis. Blend until smooth. Check seasonings before serving and add more salt, if needed. 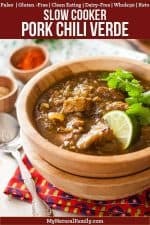 Did you try my pork chili Verde crock pot recipe? Did you like it? It may. Mine is different colors depending on the ingredients, etc. and is often more green than pictured. 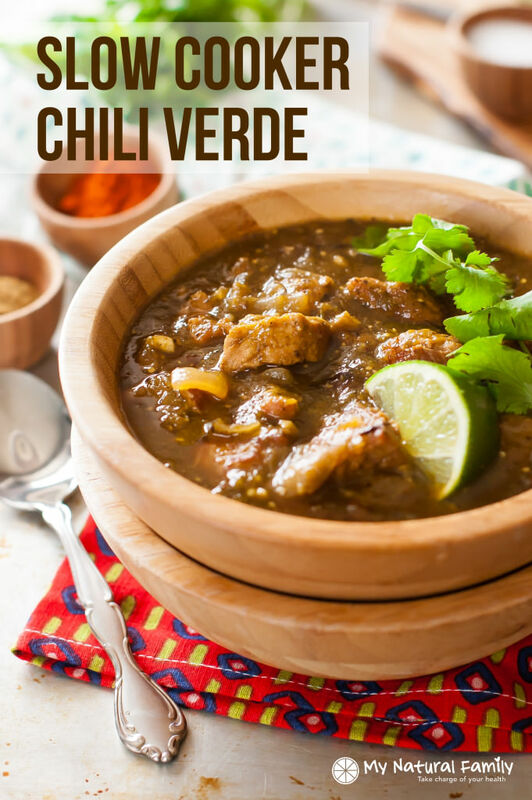 I’ve tried lots of different chili verde recipes and this is by far the best! You’re so sweet. Thanks for visiting my site! This looks amazing! Quick question, though. I’m not supposed to have pork. Do you think this could be adapted for chicken? I know the chicken would take less time to cook. Any recommendations? I haven’t tried it myself but I did a quick Google search and found several recipes for chicken chili verde so apparently, it’s totally a thing. The chili vere part is amazing, so I would give it a try if I were you. And like you said, it will just take a little longer to cook depending on how tender you want your chicken thighs. I made this for a chili cookoff contest and IT WON!!!! That’s so exciting and a huge compliment to both my recipe and your cooking! I feel compelled to comment on this recipe as I look it up for what must be the 5th or 6th time that we are going to be making it. 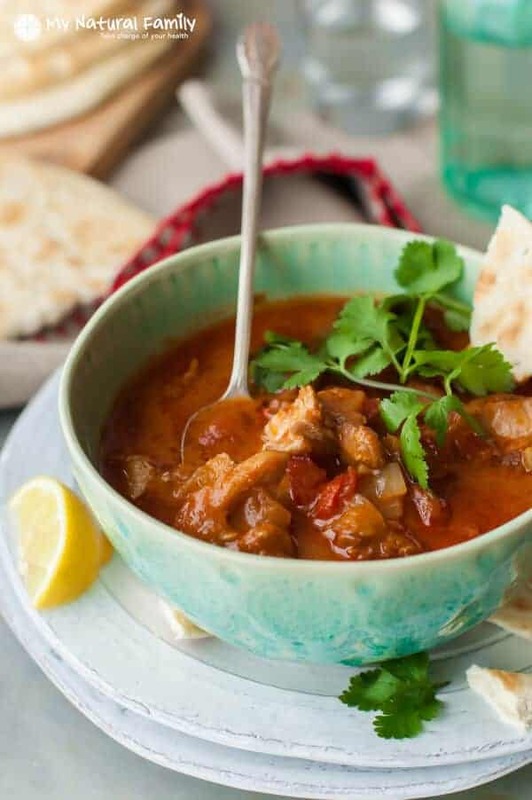 This is easily my favorite slow cooker recipe and one of the best meals I have ever tasted. It is so versatile, and so delicious, we usually eat it over red rice or make tacos and burritos with it, but honestly it is so good you can happily ea ta bowl of it with nothing else added. THANK YOU SO MUCH, for sharing this amazing recipe. I’m so glad you like it and make it regularly. It really is so good and versatile. Thanks for commenting! Delicious and filling. It’s a lot of work for a crock pot meal, as others have mentioned. However, it’s soooooo good, it’s worth it! We had enough for leftovers the next night and I froze some. I already want to make make another batch and double it so I can freeze some. I’m glad you liked it – and freezing it sounds like a great idea! Took some that I froze to know today for lunch and it held up well! Can you or anytime confirm, when you peel the burnt part of the pepper off and put the ingredients on the blender do you also put the part of the pepper left after peeling the burnt part or is it just the tomatillos and the burnt part of the peppers? You put the burnt skins from the peppers in the garbage and in the blender you put the rest of the pepper, the tomatillos, green chilis and cilantro. Does that make sense? Thanks, it turned out sooo good. Yum!! Today is Feb. 18th, 2018 and I did not see in the instructions when to add the oregano and chili powder so I just added them in with the onions, garlic and other spices and I’m sure it will be fine. Looks and smells great! My husband just asked what I was cooking and I told him Chile Verde and he said it smells delicious. Thanks for the heads up. Not sure how I missed that one, but now it’s officially on the recipe! Hi- Has anyone tried to Freeze this for make ahead meals? I see it’s alot of work for one meal, but maybe double/tripling it at once and freezing would make it easier… if it works that is. Seems to me like it would work great. I haven’t personally done that, but I’ll post it so others can answer you. My kids were weary of this new food, as most kids are, and my oldest, who is also the pickiest, LOVED it! It is generally that kid I need to please with food. His apprehension on foods rubs off on his younger brother, but after seeing the older eat it with zeal, the younger ate his up, too. We actually ate ours not as a soup but as a filling for tacos! I warmed up some small flour tortillas (the corn doesn’t hold up as well with these), topped with cheese, avocado, and lime. Yaus!!! This will be made again!! Thanks so much for your comment. I’m sure lots of others will find it useful – and I love the tacos idea! I made this dish for the first time last night. It was a big hit with my family. I just have a couple of comments. 1. I did not see anywhere in your instructions where you add the Oregano and chili powder. I ended up adding them to the onions with the other spices. Afterwards I was reading comments and saw that you were informed of this mistake 6 months ago. Just surprised that as a blogger, you have not fixed this mistake in your instructions. 2. This was a LOT of work for a crock pot meal. (The whole idea of having a crock pot is that it does all the work for you with minimal prep beforehand.) When I have made other versions of this recipe in the past, I never had to cook the onions separately and they turned out soft. I was wondering if there was a hidden purpose in this. As it was, the onions were almost over cooked. Would like to try this again later and just add the onions and the broth and the spices directly to the pot and see how it turns out. Thanks for the comments. I’ve updated the recipe now. I’m not sure why it wasn’t updated before. Yes, it is a lot of work for a crock pot meal. I usually get it ready the night before so in the morning I can just start it. If you want to cut out some steps, you don’t have to brown the meat and cook the onions, etc. before you put them in. The reason for that is to get more flavor out of the ingredients, but it’s not necessary. Is this a suitable recipe for low carb diet? I don’t know exactly how many it has, but there’s nothing in it besides the vegetables that may have a tiny bit of carbs, so I would definitely call it low carb. This dish looks SO good!!!! And the photography is beautiful. This looks and sounds delicious! I love using my crockpot especially for meat because everything turns out nice moist. I do not like chewy meat. I’m cooked with poblano peppers before but haven’t heard of the other. Sure it’s yummy, haven’t tried one I didn’t like yet. Thanks for sharing, pinning to try later! Thanks! This looks incredible! I’m drooling right now. Pinned and tweeted. 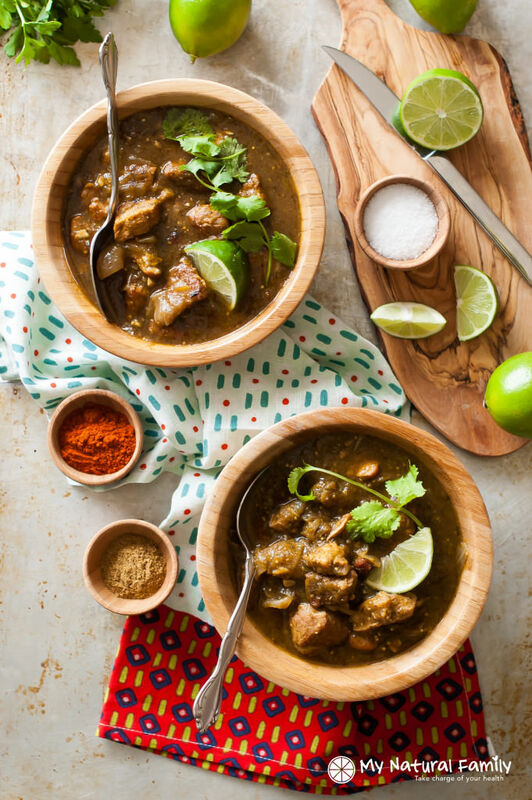 Crock pot chile Verde looks so rich, comforting and delicious! I would love to see more of your ideas! 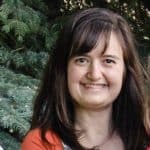 Hi Rebecca I just visited a blog that uses your essential oils in a cupcake recipe, clever ways to add to the health of our families. Your chili verde looks amazing!!! Wow this looks delicious and flavorful, and meaty! Yum to a bowl of this! Where do you add the chili powder and oregano? I love this spicy chili recipe and I am always looking for new ones. This recipe looks so good. I love meats like this that are soft and yummy. Can’t wait to make.